What's important when buying dc-connectors? 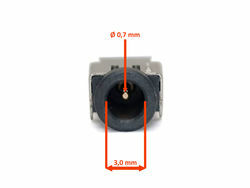 In order to find the right dc-connector, you have to measure your defective socket and then compare its size and design with those in our shop. The number of pins and their arrangement must also be considered. 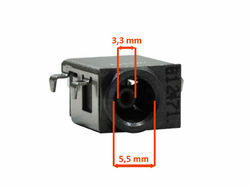 The current connectors are filtered in our shop according to inside and outside diameter, as well as according to the number of pins. 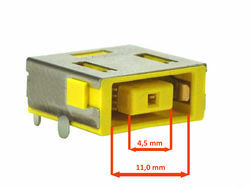 After the measuring you can select the respective characteristics and all suitable current connectors are indicated to you. All dc-connectors are universal, which means the manufacturer of your notebook does not matter. What do I need to install a dc-connector myself? The prerequisite for a successful dc-connector exchange is a basic technical know-how, because the power socket has to be soldered to the mainboard. Of course you also need the right equipment. You don't want to install the dc-connector yourself? No problem, we have our own notebook repair workshop for that. Simply register your defective notebook for repair and send it to us. For the exchange of the connectors we have a fixed price.